The Woodland Trust Scotland is appealing to members of the public to be on the lookout for the common bluebell to help track their annual march north. In recent years the average first flowering for bluebells in Scotland has been in March, but records received through the charity&apos;s Nature&apos;s Calendar project show that the flowers have only just started to spread north through England. Sarah Wiseman said: “A visit to the woods at any time of year is a great way to relax and enjoy nature, and bluebells add an extra appeal because of their vivid colour. They are one of the great heralds of spring. “Usually we would expect to see them start to flower in Scotland from March onwards, and in a typical year there would be records covering Scotland by now. But because there has been a big delay to spring this year the bluebells are about a month behind. You can record flowering bluebells at naturescalendar.org.uk. Common bluebells (Hyacinthoides non-scripta) are often known as wild hyacinths, and ‘bluebell’ can also refer to the harebell (Campanula rotundifolia). 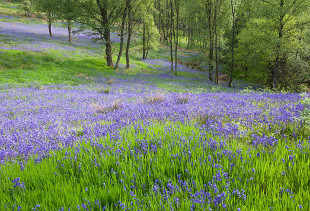 It is estimated that the UK has up to half of the world’s total bluebell population. 71% of native bluebells are found in broadleaved woodland or scrub. Bees can ‘steal’ nectar from bluebells by biting a hole in the bottom of the bell, reaching the nectar without pollinating the flower. Despite their name, bluebells can be white. If you see pink ones they are probably Spanish bluebells. Glen Finglas (pictured) in the Trossachs is a good place to see early bluebells, as are many of the shorter forest walks on Walkhighlands, just search on “Forest Walks” on the Find a Walk feature.